20 For I say unto you that unless your righteousness shall exceed the righteousness of the scribes and Pharisees, ye shall in no case enter into the Kingdom of Heaven.21 “Ye have heard that it was said by them of old, ‘Thou shalt not kill,’ and ‘Whosoever shall kill shall be in danger of the judgment.’22 But I say unto you, that whosoever is angry with his brother without a cause shall be in danger of the judgment; and whosoever shall say to his brother, ‘Raca,’ shall be in danger of the council; but whosoever shall say, ‘Thou fool,’ shall be in danger of hell fire. The thought, actually habits of thought, lead to action, to a will to kill. A gun or any weapon is a manifestation of that will, a symbol and a tool of that will; in a sense the weapon is the thought. A weapon is not just a gun or sword or bomb it can be a word; the ‘thou fool’ that Jesus refers to is also a weapon. The weapon, shaped by thought, goes on to shape our thoughts and reinforces our will to kill. This expresses the humility that is essential to the scientific project. It presents science as a collective enterprise that can be advanced by those of normal stature as well as giants like Newton. There will always be mistakes, misunderstandings and misinterpretations in our actions and in the way that we relate to each other. This is a consequence of being individuals with egoic attachments and apparently separate interests. The prime function of religion is to take us beyond the veneer of separateness to recognition of our fundamental unity with each other and with all that is. To attain this unity the Buddha taught Detachment, the Christ taught Forgiveness and the Prophet taught Submission; these are represented in the characteristic postures and practices of Meditation, Prayer and Prostration. Religions are essentially One as are we; and to go beyond mistakes, misunderstandings and misinterpretations we need to return to essence in our religions and in ourselves. I tend to perceive the three universal religions as having a particular symmetry. This is not to say that I dismiss other religions such as Taoism and Hinduism or any other; I believe that there are remarkable insights contained in all religions but there is an archetypal aspect to the triad of Buddhism, Christianity and Islam that I find fascinating. 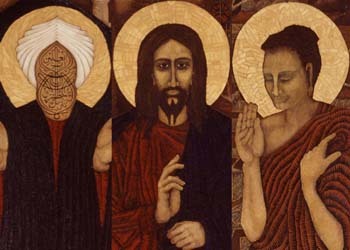 I think that the archetypes of Buddha, Christ and Prophet reside within us. The realisation of these archetypes in our own consciousness is vastly more important that the particular doctrines of these religions. Is pantheism really all that different from atheism?, it seems to me all the pantheist is really doing is to say that the universe is “God”, but as far as I can tell, this doesn’t mean the pantheist believes the universe is a person, or anything of the sort. Pantheism is the only logically consistent way in which God can be omniscient and omnipresent. If you are present everywhere and aware of everything you are necessarily everything. Pantheism differs from Atheism insofar as Pantheists understand that consciousness is as fundamental to constitution of the universe as matter, energy, space and time. Universal Consciousness cannot be said to be personal without contradiction but that does not mean that we cannot have a personal relationship with It or that it is not responsive to us. Hinduism, Buddhism and Taoism are essentially pantheist believing essentially in transcendent and immanent divinity (Brahman and Atman in Hinduism). Christian and Islamic mysticism are also affectively pantheist. I haven’t listened to all of this yet – though I read it decades ago. Also someone posted a link to an interesting blog Ownerless Mind.